Master crucial skills in patient assessment with this nursing adaptation of Bates’ gold standard resource. 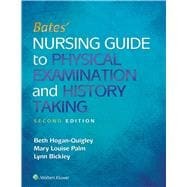 Adapted specifically for nursing students, this proven resource offers the time-perfected assessment techniques and vibrant visuals of the classic Bates’ to help students develop and practice key skills in physical examination and history taking. Reflecting the most current research in the field, the Second Edition provides evidence-based coverage of key topics, including complete head-to-toe examination, normal vs. abnormal findings, electronic documentation, and considerations for assessment of older adults and children. A clear two-column format covers examination techniques on the left and abnormalities and interpretations on the right to hone students’ observation skills and clinical acumen. A vibrant full-color design includes over 1,400 drawings and photographs to clarify key concepts and techniques. New Concept Mastery Alerts improve students’ understanding of potentially confusing topics as identified by Lippincott’s adaptive learning platform, powered by PrepU. Key culture and life span information is now highlighted throughout to make the information easier to locate. Recording Your Findings sections display samples of patient records to help students organize interview and physical examination information into an understandable documentation format. Tables of Abnormalities deepen student understanding of clinical conditions, what they should be looking for, and why they are asking certain questions. To further support students’ learning, the Second Edition is available packaged with PrepU adaptive quizzing and DocuCare educational electronic health record software. This leading content is also incorporated into Lippincott CoursePoint+, a dynamic learning solution that integrates this book’s curriculum, adaptive learning tools, virtual simulations, real-time data reporting, and the latest evidence-based practice content together into one powerful student learning solution. Lippincott CoursePoint+ improves the nursing students’ critical thinking and clinical reasoning skills to prepare them for practice.